One of the tastiest things in life are made with just a few simple ingredients. 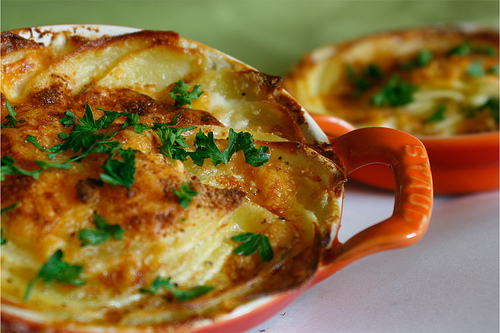 Scalloped Potatoes is one of those dishes, it consists of just potatoes, cream, cheese and butter, with a little salt and fresh-cut herbs as garnish. For extra flavor and something different, I sometimes add bacon and mushrooms and it serves as a full meal. Ok, it’s not the healthiest meal in the world but that’s why they invented treadmills. I used 4 mini oval eared dishes. Grease the dishes with butter, then rub garlic on the bottom and inner sides of each dish. Pour a little bit of cream at the bottom of each dish. Peel and cut the potatoes into 1/16-inch thick slices. Make a first thin packed layer of potatoes. In a bowl, mix the cream, nutmeg, salt and pepper. In a small pan, melt 2 tablespoons of butter and saute the remaining garlic until light golden. Sprinkle over the first layer of potatoes. Sprinkle a thin layer of Gruyère. Coat the layered potatoes with the cream mixture using a tablespoon. Layer the rest of the sliced potatoes, make sure it’s tightly and evenly packed. Pour the rest of the cream on each dish. Finish with the rest of the Gruyère. Top with bits of butter. Place 4 dishes on a baking sheet. Bake for about 50 minutes. Check for tenderness of the potatoes with a knife. This entry was posted on October 11, 2010 at 10:37 am and is filed under Cooking, Family, Friends, Musings, Random, Recipe. You can follow any responses to this entry through the RSS 2.0 feed. You can leave a response, or trackback from your own site. Oh I do love scalloped potatoes, and yours in the picture remind me how long it’s been since I’ve had them. Must try your recipe, looks wonderful! Oh yummm, a favourite for me too!! I love scalloped potatoes, but have never had them with cheese..another one of your great recipes to add to my list! Amanda, that looks WONDERFUL! Thanks for sharing the recipe!